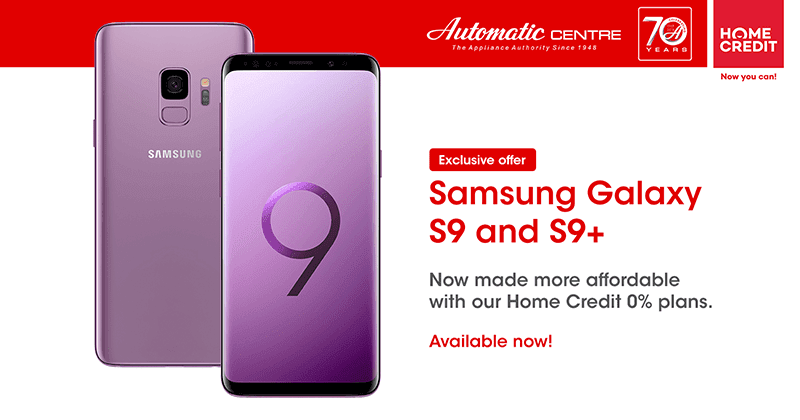 Automatic Centre also announced that the Galaxy S9 and S9+ are now available at Home Credit's Super Zero Plan with 0 percent interest installment promo. Customers may avail both the Galaxy S9 and S9+ at either 6, 9, or 12 months 0 percent installment terms with Home Credit at any Automatic Centre in the Philippines. All they need to do is fill-out the application form and submit it together with your two valid IDs and the necessary cash out. The suggested monthly pricing for the new S9 and S9+ starts at PHP 2,147.37 per month and PHP 2,490.97 for 12 months respectively, based on a 50 percent cashout. Our partnership with Home Credit has provided an avenue for those who want to get their appliances and gadgets at Automatic Centre with more affordable 0% monthly rates without the need for a credit card and we are extremely proud to add Samsung's newest flagship devices to our current offerings, said Pretz Santillan, Marketing Manager. Our customers can expect more surprises, including fantastic freebies, unbelievable discounts, easy payment terms, and a whole host of offerings to complement our 70th anniversary, Automatic Centre President Geoffrey Lim said. In case you missed it, the new Galaxy S9 and S9+ are two of the top phones of Samsung today. Both are equipped with stunning Curved Infinity Screens with the top-of-the-line Exynos processor inside. It has an innovative camera with variable aperture, super slow motion at up to 960 gps, AR Emoji, and more.